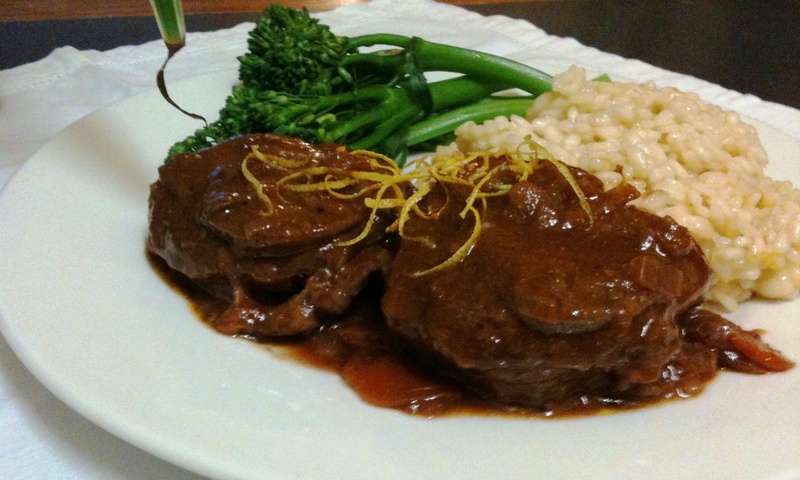 Osso Buco is a specialty of Milan where it is traditionally served with a risotto made with onions, wine and Parmesan cheese coloured with saffron. I will try to remember to include the recipe. Failing the risotto, simply serve with fluffy white rice. The Milanese have a special cooking pot for osso buco. It is a very wide, shallow cast iron casserole with a lid, and it allows the veal shanks to be cooked in one layer so that the meat does not fall off them. You can actually tie the meat onto the bone, remembering to cut the string off before presenting them! Ask the butcher to prepare the veal shanks for you. The veal classified as osso buco sold in a lot of shops is way too thin. The shanks should be about 6cm long and each should weigh about 750g. Zested lemon peel to garnish, a good teaspoon full for each person. Tie the veal shanks firmly with string. Heat oil in a heavy based frying pan and fry the shanks until they are well browned on all sides. Carefully stand the shanks upright in a heavy casserole so that the marrow does not fall out of the bones. Sprinkle well with seasoned flour, moving the shanks gently so that the fat on the meat absorbs the flour. Deglaze the pan with a little of the consommé and add to the meat. Heat more oil in pan and add the onions and garlic. Sauté gently for a few minutes, then add the carrots and celery and sauté for a further few minutes. Transfer the vegetables to the casserole, distributing them evenly around the shanks. If using canned tomatoes, pass them through a sieve or mouli first so they are well broken up before they are added. If using Italian tomato sauce, it is already done for you. Pour away any fat that remains in the frying pan and add the tomatoes or tomato sauce, the tomato paste, red wine and herbs, including the strip of lemon rind and the consommé. Bring sauce to the boil, adjust seasonings and pour over the shanks. If there is not enough liquid to cover the meat, carefully add some water. Preheat oven to 170C and bake casserole, covered, for about 2 hours, or until veal is very tender. To serve, carefully remove the cooked shanks with a slotted spoon and place one on each plate. Take the lemon rind out of the sauce and discard. Remove the string and cover each shank with sauce. Garnish with combined lemon zest and chopped parsley. Serve with Milanese risotto or plain white rice.